The IFA trade show doesn’t officially start until Friday, but gadget makers have given a sneak peek at the latest wares to be shown off at the gadget expo in Berlin. Samsung is expected to unveiled new Android smartphones and tablets, as well as a Windows Phone 8 handset. Dell and Samsung both unveiled their upcoming Windows 8 tablets, and Sony announced an impressive 84-inch 4K HDTV as well as three new smartphones and a brand new Android tablet. Samsung kicked off its IFA 2012 debut with a Mobile Unpacked event where the star of the show was the Galaxy Note II, a follow-up to the 5.3-inch phablet Samsung launched in the U.S. in early 2012. The new Android 4.1 Jelly Bean-powered Note device features a 5.5-inch Super AMOLED display with 1280-by-720 (720p) resolution, 1.6 GHz quad-core Exynos processor, 8-megapixel rear-facing camera, 1.9-megapixel front-facing camera, HSPA+ and 4G LTE cellular connectivity, and your choice of 16GB, 32GB or 64GB storage. U.S. pricing and launch dates were not announced. Samsung also beat Nokia to the punch in announcing a Windows Phone 8 device before the trade show got underway. (Nokia is expected to unveil WP8-powered Lumia handsets on the expo’s first day.) The 0.34-inch thick Ativ S smartphone features a 4.8-inch Super Amoled display, 1.5Ghz dual-core processor, 1GB RAM, 8MP rear-facing camera, 1.9MP front-facing camera, NFC, 16GB or 32GB onboard storage, microSD/SDXC slot, USB 2.0, 802.11a/b/g/n Wi-Fi, Bluetooth 3.0, and HSPA+ connectivity. 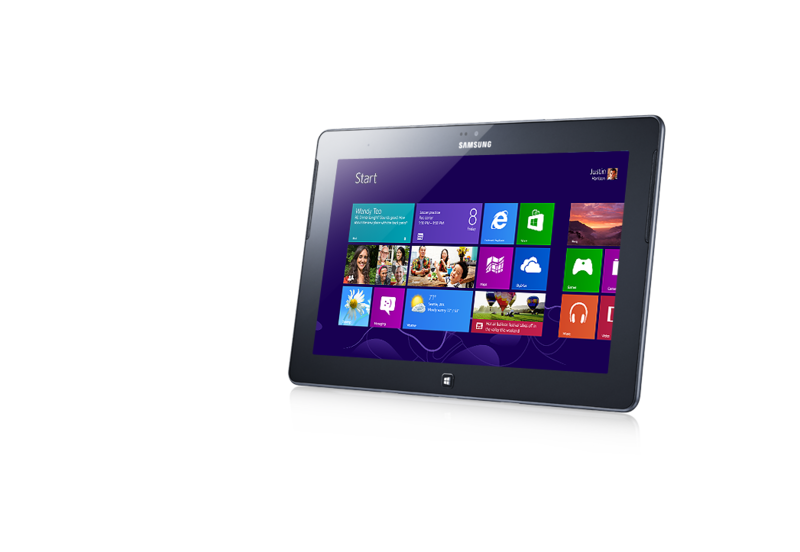 As expected, Mobile Unpacked also saw the unveiling of Windows 8 tablets from Samsung. 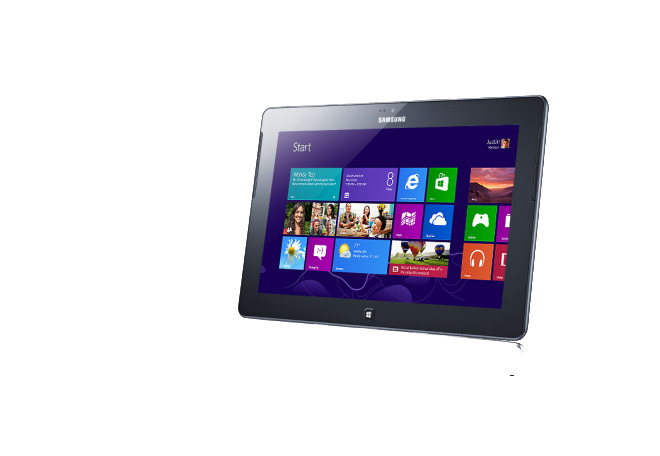 The Windows RT-based Samsung Ativ Tab features a 10.1-inch display with 1366-by-768 resolution, 1.5Ghz dual-core processor, 32GB or 64GB onboard memory, microSD slot supporting up to 64GB, 802.11a/b/g/n Wi-Fi and Bluetooth 4.0, microHDMI, NFC, a 5MP rear-facing camera and a 1.9MP front-facing camera. 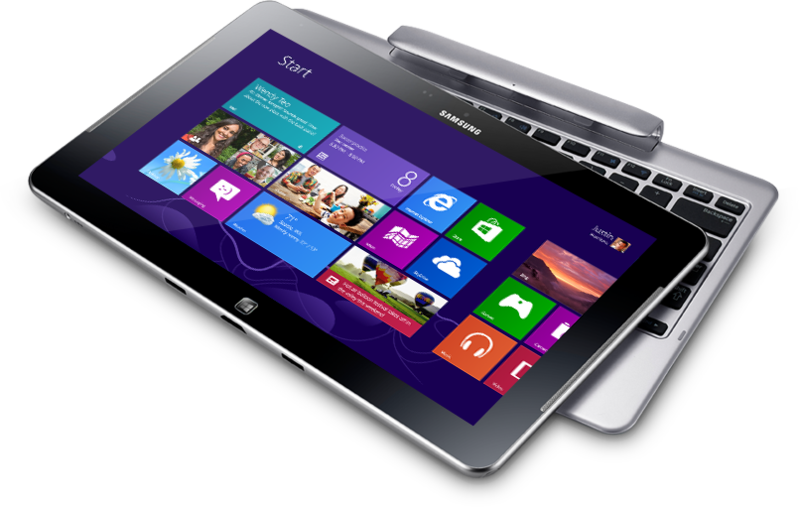 Samsung also introduced the Ativ Smart PC and Smart PC pro, both of which are Windows 8-based tablet-laptop hybrids. The Smart PC features an 11.6-inch display with 1366-by-768 resolution, 2GB RAM, an unspecified Intel Atom processor, 8MP rear-facing camera, 2MP front-facing camera, 802.11a/b/g/n Wi-Fi, Bluetooth 4.0 and optional 4G LTE connectivity. The pro version features an 11.6-inch screen with 1920-by-1080 resolution, unnamed Intel Core i3 or i5 Ivy Bridge processors and similar connectivity options as the Smart PC. Pricing and availability were not announced. Samsung also announced an Android 4.1-based point-and-shoot camera called the Galaxy Camera. The 16-megapixel camera features a 4.8-inch touchscreen with access to Google Play, a 1.4GHz quad-core processor, 1080p video capture at 30 frames per second, GPS, 8GB onboard storage, microSD/SDHC slot, 802.11 Wi-Fi and optional 4G LTE connectivity. Nikon and Sonyrecently unveiled similar devices. Dell also waded into the Windows 8 world with the XPS 10 tablet-hybrid, XPS Duo 12 convertible Ultrabook, and the XPS One 27 all-in-one PC. Dell revealed little in the way of specs, pricing or availability for the three devices. Sony unveiled an 84-inch Bravia 4K television. The HDTV features 3840-by-2160 resolution, four times the display quality of today’s 1080p sets. Pricing was not announced, but the Bravia 4K TVis expected to land in stores this year. LG recently launched an 84-inch 4K television that should be coming soon to the United States with a $22,000 price tag. The set features a picture of eight million pixels with a 3840-by-2160 display resolution. The Japan-based gadget maker rolled out more than just TVs at IFA. During its IFA press conference, Sony announced the Sony Xperia Tablet S and three new Xperia smartphonesrunning Android 4.0, Ice Cream Sandwich: the Xperia T, V, and J. The Tablet S features a 9.4-inch display with 1280-by-800 resolution, 1.3GHz quad-core Nvidia Tegra 3 processor, 1 GB RAM, and your choice of 16GB, 32GB, and 64GB storage. The Xperia Tablet S comes with Android 4.0, Ice Cream Sandwich, but an upgrade to 4.1, Jelly Bean is said to be in the works. The Xperia S will be available September 7 for $399 (16GB), $499 (32GB), and $599 (64GB). The Xperia T features a 4.6-inch display with 1280-by-720 resolution, 1.5GHz dual-core processor, 13 megapixel rear-facing camera, front-facing 720p camera, 16GB onboard memory, microSD card slot supporting up to 32GB, NFC, Bluetooth and 802.11 Wi-Fi connectivity. The Xperia V features a 4.3-inch display with 1280-by-720 resolution, a 13-megapixel rear-facing camera, a front-facing VGA camera, 8GB onboard storage, microSD slot supporting up to 32GB, NFC, Bluetooth and 802.11 Wi-Fi connectivity. The Xperia J features a 4-inch display with 480-by-854 resolution, and a 5-megapixel rear-facing camera. It doesn’t have a front-facing camera. All three smartphones will launch worldwide during the holiday season 2012. 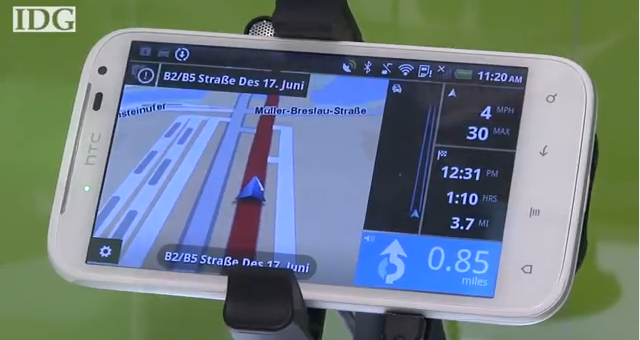 TomTom announced that it plans to launch a navigation app for Android smartphones in October. The app will be available in 24 regions worldwide including North America, parts of South America, and Australia. Pricing has yet to be announced. TomTom’s U.S. & Canada navigation app for iOS sells for $60. This story, "A rundown of the gadgets unveiled at IFA" was originally published by TechHive.